People from the south – especially big cities like Ho Chi Minh City and Can Tho – think of plums as a Hanoi specialty. 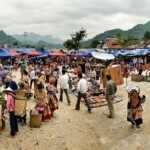 But in reality they’re grown on Bac Ha Plateau, 340km from the capital. Plums in Bac Ha, called Tam Hoa plums, are different from those in other regions. Bac Ha’s plums are greenish-red, while those of Lang Son province are pink. Out of all of Vietnam’s different plums, most say Bac Ha’s are the tastiest because they’re so sweet and have small pits. The region is called the White Plateau because it’s home to more than 1,000ha of plum trees. It’s the northwest region’s biggest plum-growing area. Tam Hoa plum farming has helped thousands of ethnic minority households in Bac Ha district in Lao Cai province escape poverty. 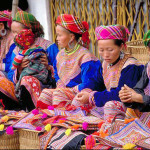 Bac Ha is home to the Mong, Nung, Tay and Phu La ethnic minority groups.